Riley Sanders with her work on Archimedes. 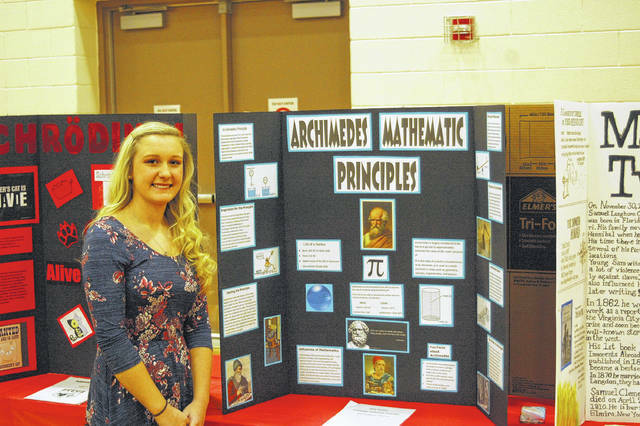 MERCERVILLE — This week, South Gallia High School students participated in this year’s school academic fair with increasing numbers. According to the project coordinator and Consumer Sciences Teacher Emily Dailey, the school had 68 projects in the high school and 20 entries from the middle school. “This is the best turnout of projects we’ve had in a long long time. They’re starting to buy into it again,” said Dailey. The academic fair covered anything the students wanted to do a project on, although many used their projects as part of the upcoming History Day, which has more strict guidelines on the project. Students covered a variety of topics; from historians to authors to famous groups of people. One individual did a project called “Wings of War” portraying military exploits from an aviation perspective. Another presented on the Salem Witch Trials from a historical perspective. 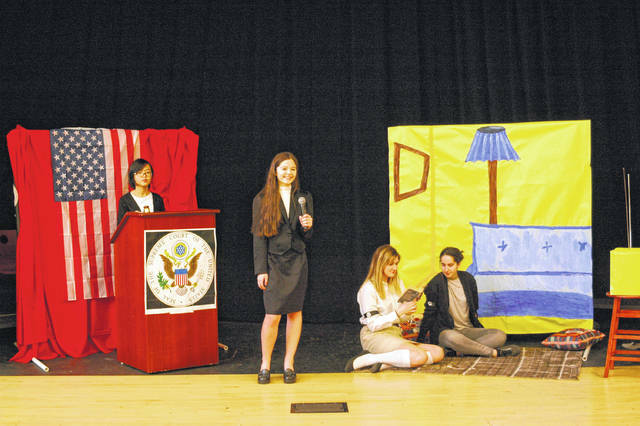 Four students got together and planned a theatrical presentation called “Tinker Versus Des Moines: the Band of Freedom,” telling the story of the silent protest of students against the Vietnam War and the court ruling that defined constitutional rights of students. Riley Sanders did a presentation of Archimedes, who is famously known for the story of learning how much gold was in the king’s crown by using the displacement of water; which he discovered while taking a bath. “I did Archimedes because he informed fields like math, physics, the military, and engineering,” said Sanders. The projects were judged according to their process by which they learned about their subject, their presentation boards, and their presentation of the material to the judges. Middle school students, while not having a further contest to present their work still benefit from participating, according to coordinator Talisha Holloway. “It introduces them to what they’re going to be expected to do,” said Holloway. Megan McGovern judged the documentaries at the academic fair, and was glad to see the most in that category they’ve ever had.